Be it the curved display or retina scanner, Samsung never ceases to amaze everyone with its innovative maneuvers. This time, Korean manufacturers took a very bold and artistic move of combining a TV with a painting. On Tuesday, Samsung launched its much-awaited range of QLED flagship TVs alongside ‘The Frame’. 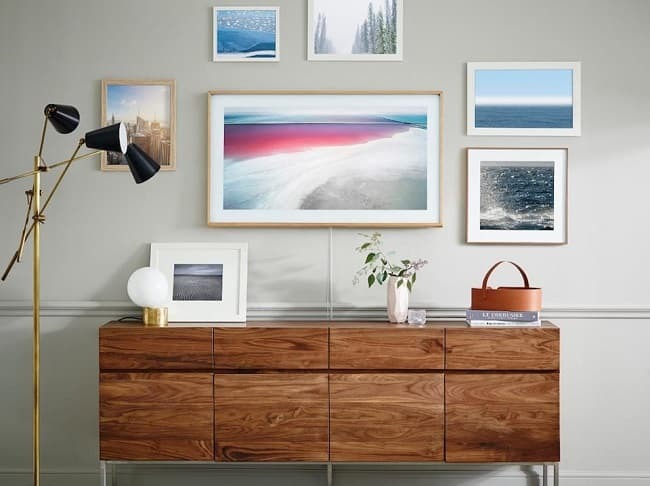 It’s all in the name – a TV which looks like a picture frame! The company has worked hard to bring the best of both the worlds together in this piece of technology. The Frame supports a special “Art Mode” which shows a digitalized piece of art on the screen when it is turned off. You get more than 100 art works in 10 different categories to choose from in a single Frame. That’s compelling enough to buy one Frame at least. Even the bezels around the Frame are made out of wood to approximate the look of a painting. The wooden borders can also be interchanged to match the displayed picture or home décor. It is designed to be wall-mounted; which makes sense, you don’t see much paintings on a stand particularly in homes. Samsung also utilized its Invisible Connection Technology to hide cable connections which can mar the clean appearance. This is achieved by using near-transparent wires and an external connection box. This TV also comes with a ‘Studio Stand ‘if you prefer to put it on a table. A ‘No Gap Wall Mount’ gives it a flushed appearance much like a painting (without any gap between wall and TV). The Frame TVs will be available to buy this Spring in 55-inch and 65-inch variants, as stated by Samsung in the announcement. There are no details about its pricing so far. Moreover, the tech used to replicate the art work look on TV is not revealed yet and it might not be a usual QLED display. Overall, I would prefer to look at ‘Horses’ rather than a black empty TV screen on a wall.